Real Madrid have easily gone past Almería this Saturday night, after beating the visitors at the Santiago Bernabéu by 4-0. Cristiano Ronaldo wasn't called for this game due to his injury status, but Di María, Bale, Isco and Morata all scored a goal each in order to deliver the 3 points to the Merengues. Real Madrid has passed another test without Cristiano Ronaldo, as they hosted and crushed Almería at home, with a clear 4-0 win. These 3 points also allow Carlo Ancelotti's men to sit tight in La Liga's second place, after benefiting from Barcelona's loss, last night against Granada. This Saturday's victory was handed by Angel Di María, Gareth Bale, Isco and Alvaro Morata goals, which helped Real Madrid keeping on track at this very important stage of the season and in the dawn of another "El Clasico" just around the corner. The Real Madrid vs Barcelona Copa del Rey final takes place this Wednesday in Valencia and according to the latest medical reports that came out to public, Ronaldo is still not expected to be fit in time for this game. The opener arrived around the 27th minute of the first half, through a great combination between Nacho and Di Maria on the right wing. The Argentina international seized the opportunity to cut inside when he was near one of the edges of Almería box, and as found enough space to curl the ball into the far post, he quite simply gave no chances to the opponent's goalkeeper to even get close to reach to it. 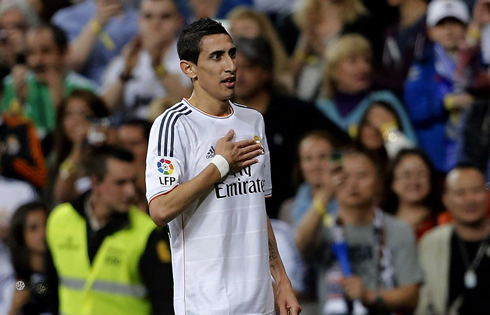 It's the 10th goal from Di María this season (his 4th in La Liga), which already allows him to set a new personal record since he arrived to Spain, back in 2010. The second half basically started with Real Madrid turning another gear up in hopes of sealing the deal as soon as possible. Almería didn't show any capability to bother the hosts and it naturally didn't take too long for the Merengues to go 2 goals up after the break. Di María and Karim Benzema led the attack through the middle corridor and the Frenchman got to assist Bale on the left, who had just been left with a lot of space already inside the box. 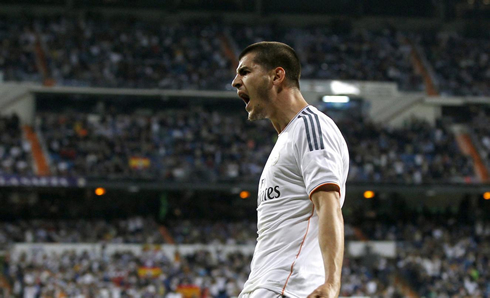 The former Tottenham winger took his time to strike the ball as he wanted and easily made it 2-0 for Real Madrid. Almería was finally put to sleep already inside the last 10 minutes of the game and it would be someone who had came in from the bench scoring that last goal of the match. Illarramendi was given way too much time to think and take a decision on what to do just a few meters outside Almería box, which allowed him to spot Morata's run and set him up with a 1-on-1 situation, after a brilliant lob pass. The "Canterano" kept his composure in front of goal and had no trouble at alll to beat Almería's goalkeeper and set the final score in 4-0. Attackers: Isco, Gareth Bale, Karim Benzema. Cristiano Ronaldo next game for Real Madrid will be against Barcelona for the final of the Copa del Rey, on April 16, 2014. You can watch Juventus live stream, Real Madrid vs Barcelona, Getafe vs Atletico Madrid, Manchester City vs Liverpool, and Swansea vs Chelsea, all matches provided from our live soccer section.